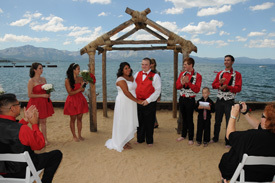 When comparing the various options of favorable beach wedding venues available in Lake Tahoe, you’ll find they each possess shades of disparities. Therefore, it’s best to be informed of the differences in order to perceptively choose a formidable location to host your once in a lifetime affair. There are innumerable optimal spots situated around the lake, and, based on your situation, you potentially may have a large medley from which to choose. 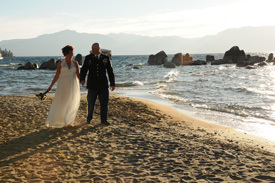 Listed here are three Tahoe beaches commonly selected by brides and grooms in addition to a few given differences that each exhibit. One of the finest public beaches in Lake Tahoe is found near the south shore in Nevada just a few miles from the casino center located in Stateline. The rocky formations of Zephyr Cove that are scattered along its shoreline are a magnificent sight and add significantly to the existing surrounding beauty. Positioned on the southeastern portion of the lake, this venue makes for a ravishing sunset ceremony. With rugged mountain peaks filling the background and owning the tone of serenity, Zephyr Cove is an exceptional place for hosting a casual, intimate wedding. In contrast to private beach locations, this site is geared toward small groups and the event is conducted in an informal setting in which seating is not available. If desiring a pleasant park-like setting on a grassy knoll that’s elevated above but adjacent to the lake’s sandy shore, Regan Beach is a perfect place to celebrate a special day. 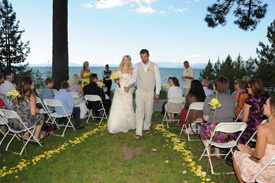 Central to town on the south shore of Tahoe, this waterside venue allows you and your guests a spacious and private spot under the shaded pine trees and is lined with scenic beauty. The rich blue water engulfed with the resplendent Sierra Nevada Mountains portrays the scene of where your ceremony will occur. With a reservation, exclusive use of the area allows you to provide seating for your guests along with your preferred decorative arrangements. Suited for large parties up to 150 or more, Regan Beach is a pleasing venue with admirable amenities. For an exciting affair on the sand at the water’s edge, Lakeside Beach represents a topnotch site and is picture-perfect for planning an event of a lifetime. Convenient access and large group accommodations in a private lakeside setting that is second to none are only a few of the features this appealing venue has to offer. Uninhibited picturesque natural surroundings that include towering peaks and sapphire colored water are additional highlights of the site’s appeal, providing an impressive place to walk down the aisle of matrimony. Chairs for guests, an arch, a sound system for music, and a staff attendant that will assist with all facets of the wedding ceremony await you at this invigorating location. 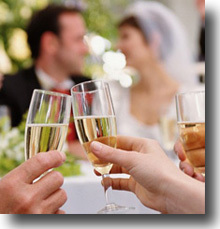 Suitable for a formal or informal occasion, Lakeside Beach serves as a great opportunity for hosting your wedding. Knowing specific details about the locales within your search when trying to decide on a wedding location will expectedly narrow your choices, which will ultimately bring about an agreeable and fitting selection. Observed disparities of the three contrasted venues above vary mainly in group size accommodations, public area versus private, and allowable seating for guests. Group size limitations of a particular option is obviously a pivotal factor, and allowance or disallowance of seating is also deserving of attention based on whether you will want to conduct the ceremony formally as opposed to holding an informal standup event. 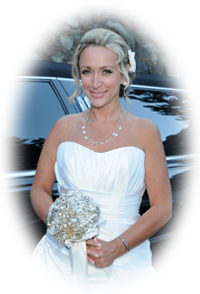 Nevertheless, whatever your situation dictates, a Lake Tahoe beach wedding at any of these favored locations is certain to delight you and your guests, undeniably delivering an experience that will give an ongoing impression of a very noteworthy occasion. This entry was posted in Prodigious Wedding Venues. Bookmark the permalink.